This post is sponsored by GoodBelly and is an entry in the Reboot Recipe Contest hosted by Go Dairy Free. When Hippocrates made the claim that all disease begins in the gut, the hard science was lacking on exactly how the gastrointestinal system worked and how best to support it. Fast forward 2000+ years and studies are coming out the wazoo (pun intended) that offer conclusive evidence for how we can nourish and maintain our digestive tracts and live healthier lives. If you’ve got serious GI issues, identifying foods you may be allergic or sensitive to is a great place to start in improving gut health. Treating infections and banishing parasites, “bad” bacteria overgrowth, and yeasts are other considerations. For all these conditions, you’ll likely find the most help from a Functional Medicine doctor or highly experienced nutritionist. Take a full-spectrum digestive enzyme with meals—if we don’t have enough digestive enzymes in our gut (and many aging adults do not), we can’t properly convert the foods we eat into the raw materials that the body can use. Up your intake of fermented foods and/or add a broad spectrum probiotic supplement to your diet. Introduce prebiotic foods and/or supplements to your diet. If that last one stumped you, don’t worry, you’re not alone. What the Heck is a Prebiotic? Most of us are familiar with PRObiotics. But what on earth is a PREbiotic? For the last few years, I have heard the word “prebiotic” tossed around in health circles but never paid it much attention until I learned of the synergistic relationship between probiotics and prebiotics. Now, I’m really dumbing it down here, but probiotics are simply the “good” bacteria that help keep our digestive system healthy by controlling the growth of, and crowding out, harmful bacteria. Prebiotics, on the other hand, are what probiotics feed on—essentially probiotic fodder. Prebiotics are certain non-digestible fiber compounds found in certain foods like chicory root, oats, asparagus, jicama, Jerusalem artichokes and bananas to name a few. By adding more of these foods or a prebiotic supplement to your diet, you may make that probiotic supplement you’ve been taking even more effective. But before you run out to buy a prebiotic supplement to pair with your probiotic, I should add that if your diet is right and balanced, a separate prebiotic supplement may not be necessary. And those with full blown cases of small intestinal bacterial overgrowth (SIBO), IBS, or a FODMAP intolerance may need to steer clear of added prebiotics. And in general, a good tip with prebiotics is to start slow to avoid a raging gut party with excessive gas and bloating. These conditions aside, if you sense your gut just needs a little TLC, adding probiotics and prebiotics in food or a supplement form may be worth a try. Next week I will be rebooting my gut and hope you will join me and thousands others as we take part in the 12 Day GoodBelly Reboot that starts September 12, 2017. 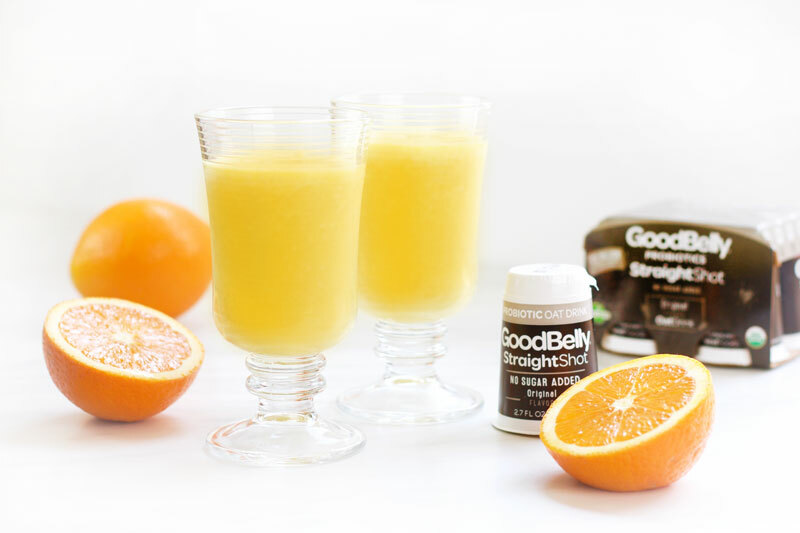 In addition to cutting out all forms of junk, I will be enjoying a GoodBelly StraightShot probiotic drink and adding a teaspoon of prebiotic inulin powder to a smoothie each day—that’s all there is to it (the addition of prebiotic inulin powder is my choice). Like GoodBelly, I don’t want you to simply trust that probiotics are “good for you”— I want you to experience it for yourself and see what a good probiotic might do for your gut health. Please note that ONLY GoodBelly products with GREEN tops are gluten-free. To join in the fun, start by visiting the 12 Day GoodBelly Reboot page. Sign up to grab a GoodBelly coupon that will cover you for 4 days of the reboot (that’s a pretty great deal, huh?). While you’re there, explore the benefits of taking GoodBelly’s in the 12 Day Reboot Portal. If you’d like, join the 12 Day Belly Reboot Facebook Group for tips, recipes, and to see how other Rebooters are getting along. 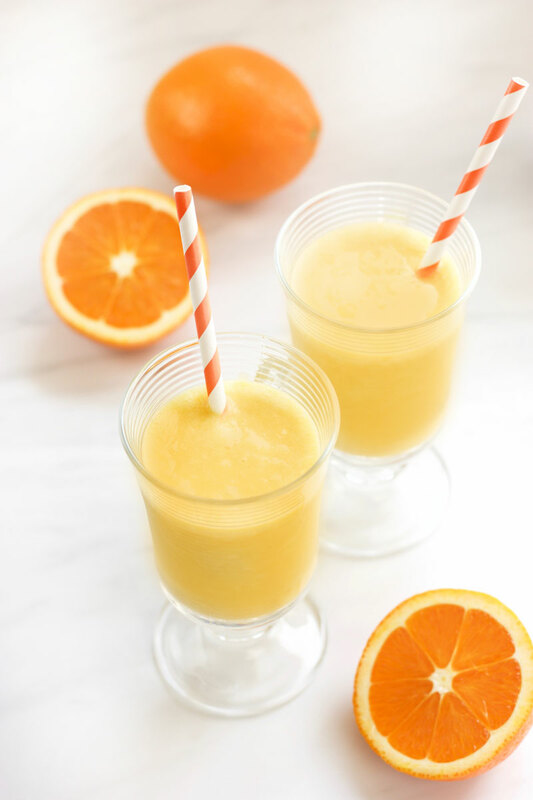 One of my favorite smoothie combos is one that’s reminiscent of an Orange Julius. Remember those? 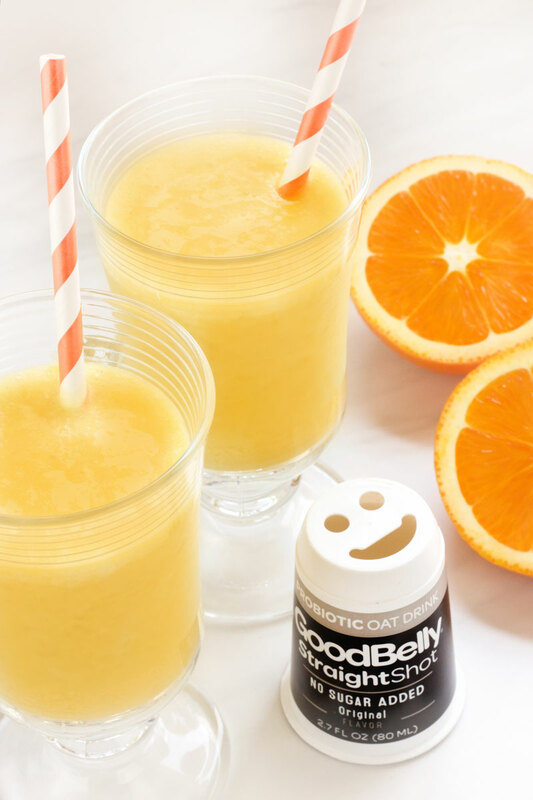 Adding a GoodBelly Straight Shot and a prebiotic supplement like inulin powder or potato starch has transformed this copycat Orange Julius it into a healthy, gut-boosting smoothie. The cooked spaghetti squash in the recipe may sound a little unusual, but trust me when I say you won’t even taste it. Frozen spaghetti squash is one of my favorite smoothie ingredients because it’s so neutral in taste and really bulks up a smoothie with good dietary fiber. With that, CHEERS! Maintaining a healthy gut has never been easier. Not all GoodBelly products are gluten-free. Please read nutrition labels carefully if you need to avoid gluten. GoodBelly products that ARE gluten free have green caps. Add all ingredients, except for ice, to blender carafe. TIP: Cooked spaghetti squash is a fun and fiberful addition to any smoothie. In the event I overcook a spaghetti squash, I will freeze mounds of it an a baking sheet and use later in smoothies. Using frozen squash is my preference and allows me to cut back a bit on ice.